Tytania is a Japanese series of novels written by author Yoshiki Tanaka with illustrations by Katsumi Michihara. Formerly published by Tokuma Shoten, now currently under publication by Square Enix. With the first edition to the series published in 1988, the series has yet to be completed with the latest novel published in 1991. The series has been adapted to a shōnen manga also written by Yoshiki Tanaka and illustrated by Gantetsu. Published by Kodansha in Monthly Shōnen Sirius magazine, it was first put to print on March 26th, 2008 and is ongoing. An anime was also adapted from the work written by Ken'ichi Kanamaki and directed by Noboru Ishiguro for Artland studio and premiering in the NHK-BS2 network. 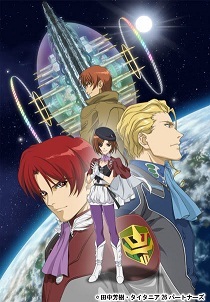 The anime originally ran from October 9th, 2008 to March 26th, 2009, with a total of 26 episodes. Tytania is currently available in North America via the Anime Network's online player . The story of all incarnations of the work are set in a future where humans have spread their influence to many planets. The Empire of Valdana is under the control of the wealthy and powerful Tytania clan, having forged its influence through intimidation and economic might. In the year 446, the Tytania clan dispatches a large fleet to make an example of the planetary city-state Euriya; surprisingly Euriya decides to resist, and wins. This sets in motion a series of rebellions poised to topple the influence of the Tytania-controlled Empire of Valdana. Lord Ajumarn Tytania is the current Landless Clanner (Landless King), and heads the formidable family with four young Tytania dukes. Duke Ariabert: The fall guy of the four. Duke Jusran: "If I become leader, it means the clan is in serious trouble." Duke Zarlish: The proud and stalwart of the four dukes. Alses Tytania: Bishōnen brother of Zarlish, Reassigned to Antarctica. Telyza Tytania: Mother of Zarlish and Alses. Duke Idrice: The Chessmaster of the quartet. Elwin and the Duchess Laetitia, his Unlucky Childhood Friend. Estolardo Tytania: step brother of Ajumarn, considers himself to be better suited to be the Lord Clanner. Balimi: Son of Estolardo, hostage. Princess Lydia of the Kingdom of Elving: Voluntary hostage. Future Lady of War. Fan Hyulick: an almost irresponsible general. Lira Florenz: Action Girl and Fan's Love Interest. Miranda: Captain of the ship "Honest Old Man". Accidental Misnaming: Alses never gets Fan's surname right, and keeps calling him "Hyuren". Appeal to Force: Duke Zarlish's solution to the jurisdictional dispute with Esterl. Ax-Crazy: Tereza Tytania after Alses dies. Beware the Nice Ones: Belami might look like a courteous, respectful, and soft-spoken young man but do not insult his father. Big Bad Wannabe: Estrade Tytania is not the chessmaster he thinks he is. He was actually being set up to rebel by Jusran, who knew all about his ambitions and wanted his co-conspirators out of the way before he could make the Gambit Pileup worse. Even his death was just a side effect of everything going on. Casanova Wannabe: Radomorz, though less humorous than many; he thinks that all women are his property by right and doesn't really care about their opinions on the subject. Disproportionate Retribution: Fan and Alses motives for revenge in episode 12 has shades of this. Everyone Calls Him "Barkeep": The Captain of the Honest Old Man who apparently is known only as captain. Galactic Superpower: The Empire of Valdana originally. Glass Cannon: The weapons Fan uses to win his first battle. Massively powerful space guns... which are only good for one shot, as they explode after firing. Gray and Grey Morality: Tytania, by and large, aren't all that bad as empires go, and Fan is an Anti-Hero who only goes after them when it gets personal. Jurisdiction Friction: The Esterl government steals Fan Hyulick out from under Tytania's nose and holds him prisoner because Esterl City is their jurisdiction, not Tytania's, leading to a political circus. Never Found the Body: When Fan Hyulick is presumed dead, everyone (except Zarlish) wants to see the remains before they count him out. He's alive. N.G.O. Superpower: The Tytania clan is essentially the de facto rulers of the Empire of Valdana, is extremely wealthy and even own private armies; yet it does not personally own any fiefdoms. Hence the moniker "Landless Lord" for Lord Ajumarn. No Kill Like Overkill: In show of defiance and without permission from the Clan Lord and the other Dukes, Zarlish takes a large fleet of ships from Estahlto Cronos to take Fan back to the crystal palace to be executed. Old Shame: In-Universe, Ariabert's loss at the "Battle of Cerberus" became this for him. Though in later episodes this is downplayed. Pyrrhic Victory: Fan Hyulick's first victory. Even though his Defensive Feint Trap destroys the entire enemy fleet, it has to rely on his own getting almost totally destroyed as well so a few of them can escape before the highly destructive Glass Cannons destroy everything. Scarpia Ultimatum: Reversed; Lira climbs on top of Fan in the middle of the night to recruit him for La Résistance, but he isn't up for it. Smug Snake: Idrice Tytania, so much. Spell My Name with an "S": Most of the names have multiple possible spellings, especially with the sheer number of Ls and Rs. Springtime for Hitler: Fan Hyulick was supposed to put up token resistance then surrender, not to defeat the mighty Tytania. Staring Down Cthulhu: President Albert Kanack of Esterl. He will not submit to force of arms, and will not just hand over Fan Hyulick to Duke Zarlish without the proper forms being filled out, even if Zarlish's fleet has control over his planet's orbital space. Stuffed into the Fridge: Since the series is half over and the hero is still moping around the galaxy, this is done to Lira to get him up and moving. Two Lines, No Waiting: The supposed A-plot, Fan Hyulick's rebellion against Tytania, is essentially a sideshow to the power struggle within the Tytania family. Ugly Guy, Hot Wife: The Captain & Miranda is a somewhat inverted version of this trope.